A stylish way to impress whether you’re at work, home or with friends these gold plated cufflinks are a statement piece and the perfect way to accessories a shirt. A gift he’s sure to adore these cufflinks can be engraved with his initials and are delivering a beautiful presentation box. 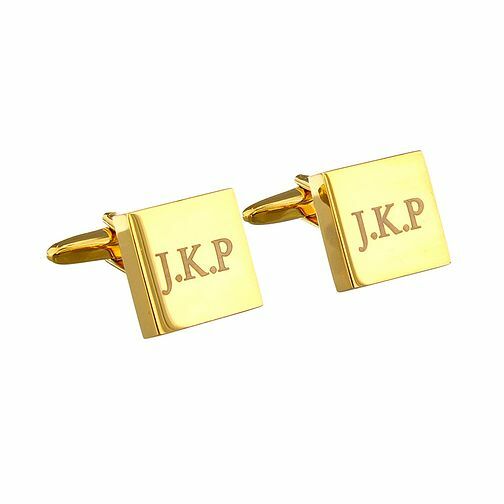 Engraved Gold Plated Square Cufflinks is rated 4.5 out of 5 by 2. Rated 5 out of 5 by Anonymous from Smart with initials Classic gold, clean cut style with professionally engraved letters. Rated 4 out of 5 by Anonymous from Perfect for my partner! Bought these for my partner and exactly what we were after. earthed around for ages trying to find plain gold cufflinks. Fab quality and will deffo be buying more!!! !